Imagine for a moment that every new car came with a mandatory ashtray, regulation goggles, and a hand-squeezed horn. That’s the kind of antiquated standardization that applies to the contemporary apartment, which is designed to be wildly out of step with modern life. The modern home was conceived for a social structure that is virtually obsolete — the nuclear family — and governed by rules that no longer apply. Half of all Manhattanites live alone, most of them in apartments built for two or more. People who never cook pay fortunes for useless kitchens. Roommates dodge the law when they divide up four bedrooms and turn the dining room into a fifth. An elderly widow living alone hangs on to her sprawling, rent-controlled apartment, mostly because she’s paying too little to contemplate downsizing. This is a lunatic market. Maybe that can finally begin to change. The Bloomberg administration has selected a team, consisting of Monadnock Development, the Actors Fund, and nArchitects*, to construct a building with 55 microunits, on a city-owned lot at East 27thStreet and Second Avenue. At the same time, the Museum of the City of New York has opened “Making Room: New Models for Housing New Yorkers,” which lays out an assortment of options for living small and identifies the rules that would have to change to make them legal. The design solutions are ingenious but not new. Sleeping lofts, Murphy beds, fold-down tables, stackable chairs, and ample, claustrophobia-reducing windows — there’s little here that hasn’t been featured in ship’s cabins, railroad sleepers, and hotel or dorm rooms. (Also prison cells.) Architects are efficiency experts, and good ones think in square inches as fluently as they do in square feet. The show even includes a walk-in mini-apartment with a large flat-screen TV that slides away to reveal a hidden bar, which feels like a piece of décor from a vintage James Bond movie. The real innovation, though, is the mayor’s apparent willingness to adapt regulations to the way people actually live: alone, in groups, in single-parent households, or in a mix of generations. There are of course drawbacks to defining “cozy” down. Let developers stack people even more densely than they already are, and the neat, sleek cabins of today could turn pretty quickly into pestilential shoeboxes. After all, limits on how many tenants could be packed into how small a space exist because of the inhumane conditions in tenements a century ago. In the new city-sanctioned building, some units will be designated for affordable housing, but the market-rate units are projected to go for more than $1,800 a month, which means that New Yorkers can be more expensively cramped than ever. Still, the well-designed microapartment can be a fresh option in an ossified market, and, more important, it may lubricate the economics of affordable housing. 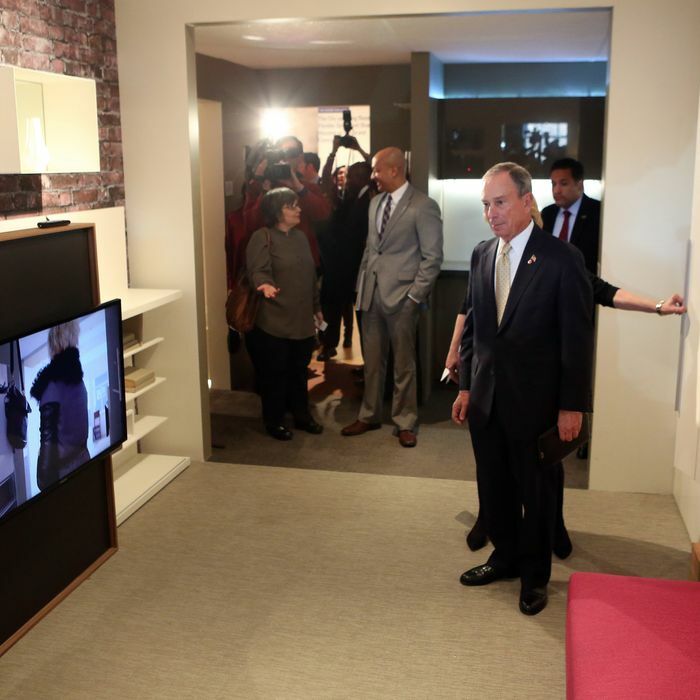 Bloomberg may not want to claim this as his legacy, but he could be the mayor who brought New York the 21st century flophouse. * This post has been corrected to show that the firm designing the microapartments is nArchitects, not nArchitecture.